The son of Adrian Lewis and Lynda Needham, Lewis was born in the city of Leeds, West Yorkshire, and raised in the nearby town of Horsforth. He has two brothers: Chris Lewis and actor Anthony Lewis. He attended St Mary's Menston Catholic Voluntary Academy. He has been acting since he was five years old. He started off with minor roles in television programmes, debuting in Some Kind of Life. During the filming of Harry Potter and the Order of the Phoenix, Helena Bonham Carter, who portrays Bellatrix Lestrange, accidentally ruptured Lewis's eardrum when she stuck her wand in his ear. The author of the Harry Potter series, J.K. Rowling, gave a speech during the final world premiere of Harry Potter and the Deathly Hallows Part 2 on 7 July 2011 in London, England. She stated that there were seven major cast members in the series, whom she referred to as The Big Seven, and she named Lewis as one of the seven members, along with Daniel Radcliffe, Rupert Grint, Emma Watson, Tom Felton, Evanna Lynch, and Bonnie Wright. Shot prior to the release of Deathly Hallows, Lewis played the reporter in the independent film The Sweet Shop. Lewis played the character Jamie Bradley in a five-part TV series called The Syndicate written by Kay Mellor, which was broadcast on BBC One in spring 2012. In July 2012, Lewis appeared in a music video called Filth by A Band of Buriers; Matthew co-starred with actress Lily Loveless, who together portrayed boyfriend and girlfriend in the video. Lewis played the role of Dodd in the 2012 film Wasteland (known in the UK as The Rise), written and directed by Rowan Athale. The film was screened at the Newport Beach Film Festival on Sunday, 28 April 2013 and Monday, 29 April 2013. Lewis also stars as Patrick in Me Before You which was released in theaters in June 2016. In June 2012, Lewis was confirmed to play Mick in the West End stage new production of Our Boys by Jonathan Lewis. The role marked Lewis's West End debut. He starred in the play alongside Cian Barry, Arthur Darvill and Laurence Fox. The play started its previews on 26 September 2012, and played regularly from 3 October 2012 until 15 December 2012 at the Duchess Theatre, London. 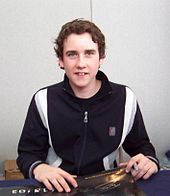 Lewis has described his association with the number 11 and how it has appeared multiple times throughout his life, such as being 11 years old when obtaining the role for Harry Potter. He has a tattoo of the number 11 on his right arm and clothing with the number 11 on it. Lewis has lived in London since 2015. 2013 Wasteland Dodd The film is also known as The Rise. 2016 Me Before You Patrick Based on novel of the same name by Jojo Moyes. ^ a b "Matthew Lewis". Infoplease.com (Sandbox Networks, Inc.). Retrieved December 21, 2015. ^ "Interview with the Gryffindors: James and Oliver Phelps, Matthew Lewis, Devon Murray". Veritaserum.com. n.d. Archived from the original on 27 September 2011. Retrieved 18 July 2011. ^ Steve Daly (13 July 2007). "Helena Bonham Carter Gets Wicked". Entertainment Weekly. Retrieved 18 July 2011. 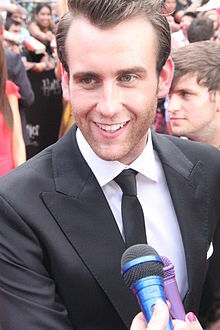 ^ "Exclusive: Matthew Lewis talks Verdict, confirms new Deathly Hallows: II battle scene". SnitchSeeker.com. Retrieved 8 November 2011. ^ realised in cinemas in June 2016"Was released in cinemas in June 2016steland Newport Beach Film Festival 2013 Screenings"
^ Sarah Freeman (13 April 2011). "Learning how to earn a living after Harry Potter ends". Yorkshire Post. Retrieved 18 July 2011. ^ Laura Davis (29 March 2011). "Susan Penhaligon leads all-star cast for Agatha Christie's Verdict at New Brighton Floral Pavilion". Liverpool Daily Post. Archived from the original on 15 November 2011. Retrieved 18 July 2011. ^ Leeds Rugby Foundation website list of vice presidents. ^ "Matthew Lewis thinks his Ripper Street moustache makes him repellant to women". This page was last modified on 8 November 2016, at 21:10.